Review Snapshot: New to the indie scene, Chicago band Maps & Atlases mash a folk rock sound with the math rock genre to produce a well-thought out and emotional debut album. A recurring theme of bitterness around break-ups is often disguised by a cheery nature in what could be one of the must-have indie albums. Full Review: Folk rock has been an increasingly popular genre for the past two years. Whether you consider it from a mainstream point of view (Mumford and Sons, Laura Marling) or if you are more inclined to take an Indie perspective (Frank Turner) it has no doubt been growing in influence. This year sees a new American band combining the ever-growing folk rock style with a less appreciated genre that originated in the 1980s, known as “Math Rock” (others tagged with this genre include Ghosts and Vodka, Dilute). 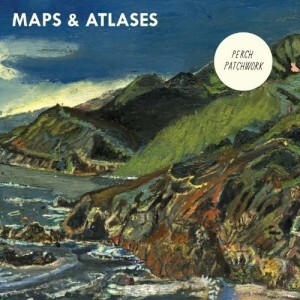 Although Maps & Atlases apply the asymmetric rhythms of the genre, the folk undercurrents of their debut album Perch Patchwork cannot be denied. It is a clever fusion, bound to get them noticed in certain indie circles, if not more widely. In general the album is one with an air of regret, inevitably girl-related regret, as well as a weariness with a somewhat wild and youthful but beyond youth lifestyle. The former however, is dominant throughout, most notably in second track The Charm (“I don’t think there is a sound that I hate more than the sound of your voice.” ) The lyrics speak for themselves; clearly this album has been written off the back of a wearying and heart-breaking relationship. Musically the album is strong; the recurrent lyrical theme played out in different musical guises. Pigeon is a more cheerful sounding lament; however there does seem to be an air of cynicism in it as the singer appears to be bothered by a woman’s unmovable pride. The interchanging sounds from song to song keep the listener intrigued as it becomes apparent that this is not another 4-Chords-suits-all kind of outfit. For example, at the beginning of the album, Will sounds like anything apart from folk music. Void of lyrics, the song still manages to evoke feelings of relaxation and simple joy through pleasant musicianship and meaningless warbling. Another lyric-free track is 'Was', which has a delightful guitar riff but manages to portray the opposite emotions stirred by Will. A poignantly beautiful treat to the ears. That the band can produce two songs with the same wordless methods, yet provoke two opposite emotions, suggests a band of intriguing musical talents. A delight of an album that is a relaxing and intriguing listen, lacking any hideous or off-putting flaws.